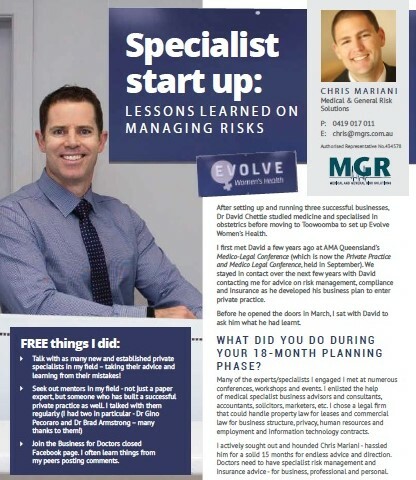 We recently interviewed Dr David Chettle, who opened Evolve Women’s Health in Toowoomba in March 2018 – asking him what he leant he learnt on risk management, compliance and insurance as he embarked on setting up his own specialist obstetric practice. On the business side Chris explained the range of insurances available, costs of each, what they do and do not cover, individualised advice as to what I need in my situation so as to not over/under insure against the risk. We had lots of discussions of “new” risks in the field of cyber/ privacy – especially given new legislation in February 2018 on the Notifiable Data Breaches scheme. We talked about the risks associated with having my systems and data hosted professionally in data centres vs that of having an in-house server. Chris took me through privacy legislation and what to do to get compliant, AHPRA advertising guidelines, the risks of fraud in medical practices and other common risks. I also discovered IT firms want you to sign contracts that indemnify them and deny you the right to seek compensation from them where they are negligent.… So, if you sign, you are likely waiving your insurers rights to recovery which may render your policy void! Thankfully with my legal team and Chris’ help along with an amazingly keen IT firm (Greenlight ITC), we made significant headway to producing an agreement that is actually fair and reads as it should “you stuff up – your fault, you fix it, I stuff up, my fault”. A number of IT firms I spoke to commented “no doctor has every raised an issue with our contract and all signed without question”. I find it amazing that this is the case, because if you take the time to read the contract, no sane person would agree to it.